In the time I have been in this hobby, I have met many great people. I have especially enjoyed the interesting people I have met on my two trips to Troy, NY to the home of Rototiller and Troy-Bilt. On my last trip in 2012 I have the pleasure of meeting Mr. John Pattison, a former employee of Troy-Bilt, who grew up around Rototiller's founder, CW Kelsey. 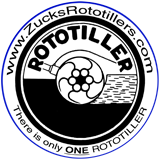 John's father was part of a law firm who represented Rototiller, Inc. in its business dealings. John has an interest in a vital part of a tiller - the tine. He has researched and written a very informative article on the evolution of tines. I am pleased to host this article on my website.